"I took this photo out the window of a moving car with my Nikon D50, using the stock 18-55mm lens at 38mm," said Phil Sager. 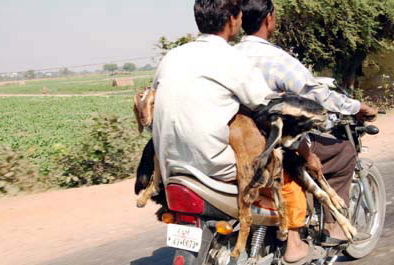 It really shows how things are done just a little bit differently in India. This was also the day I finally started to appreciate my new Digital SLR. I am used to traveling with my faithful Canon Elf 230 (it had been run over by a taxi an keeps on clicking), and I was seriously annoyed with the weight of the SLR until I got the shots I took that day. The lens options and the speed at which it can operate make it worth the trouble of lugging it around."